Planning your first trip to Pride during the first weekend of June? Everyone is welcome to attend, but you may be wondering about some of the steps Pride takes to ensure that events are accessible to people living with a variety of disabilities. All Pride Winnipeg ran sites are wheelchair accessible with accessible washrooms, entrances, and grounds. We also offer accessible parking spaces for our parade entrants. Festival-goers can also look for the Red Tent again this year, which offers a quiet and safe space for those who require it. “All of our events are offered with ASL interpretation, with the highlight of our ASL services being offered at the festival,” Amanda continued. “We have on-stage ASL interpretation of all speeches, as well as music lyrics. You can start planning your visit to Pride 2018 by accessing pride guides in both paper and online. You can pick up paper copies at TD bank locations, Rainbow Resource Centre, Red River College, Club 200, Millennium Library, ALT Hotel, SERC, and Klinic. You can access the online guide on our website here (link to: https://www.pridewinnipeg.com/pride/pride-guide/). Pride Winnipeg encourages anyone with disabilities or who require special assistance to reach out so that arrangements can be made. Pride has on-site ASL interpreters available for patrons who would like assistance or for those who would like to have someone to sign with. To help Pride prepare for your visit, please feel free to reach out to us at accessibility@pridewinnipeg.com. A block party in support of Pride Winnipeg’s Resurgence Fund. Join us for awesome music from DJ Roy, entertaining hoop dancing, local drag queen superstar Victoria Lush, cold refreshments, and tasty food trucks! Beverage tent entry is 18+ with valid photo ID. Find more information please visit the Facebook Event Page. 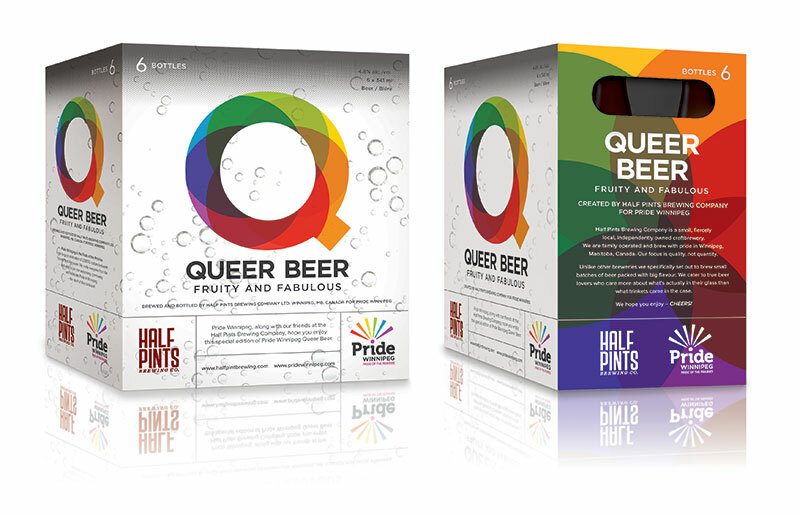 Pride Winnipeg and Half Pints Brewing Co. are pleased to announce that Queer Beer is here! What better way to ring in the 2018 Pride Winnipeg Festival than with a refreshing Manitoba made Queer Beer. The beer is brewed as a Helles, which is a German Pilsner. It has a mild taste, with a slightly fruity aroma derived from the hops. It’s the perfect match for the Pride Winnipeg Festival, but just as fabulous for any other warm sunny day. Queer Beer can be purchased in participating Liquor Mart locations in Winnipeg with a portion of the proceeds of each sale going to Pride Winnipeg to assist with festival. Queer Beer will also be served right from the keg during the Festival at the Forks for the closing weekend of the Pride Winnipeg Festival June 2nd and 3rd. For more information at the Festival at the Forks please visit www.pridewinnipeg.com/pride/festival-at-the-forks. It’s the most exciting time of the year for some Manitoba folks—the launch of Pride Winnipeg happens on Fri. May 25 with a flag raising at Winnipeg’s City Hall. Soon after, the second annual Two Spirit Pow Wow will happen at The Forks. Mark your calendars for Sat. June 2 as you don’t want to miss this exciting event. Last year, the Two Spirit Pow Wow was a new event for Pride Winnipeg. Including a pow wow as part of the celebrations is an impressive step for many reasons, including the fact that according to many cultural practices, two-spirit people have been revered by their communities. The term “two spirit” is a way some Indigenous people refer to those in their communities who may identify as gender-variant, gay, lesbian, queer, and/or trans. Pow wows are a great opportunity for people from all cultures to come together to dance, sing, celebrate, and make new friendships. For the second year in a row year, Pride Winnipeg has been working hard to branch out and bring more diversity to both its advertising materials as well as the events. The Two Spirit Pow Wow is a great way to create a safe and celebratory space for both Indigenous and non-Indigenous community members to come together and share in the rich culture of First Nations people. Pride Winnipeg events continue throughout the week, culminating in an exciting and lively rally and parade on Sun. June 3. You can join in the rally at the Manitoba Legislature grounds beginning at 10 a.m. on Sunday. You can also find a wide variety of Pride events, including “queen” bowling, rooftop parties, single’s nights, a church service, a vigil, a talk about mental health, an awareness workshop for immigrants and international students, lesbian lube wrestling, a Pride run, a slo-pitch tournament, bingo, an underwear party, and more!